It was a bit of a movie weekend as we dive into the dead of Winter. Friday night I went to the movies for the first time in 4 months. The last movie I decided would be good enough to pay to see was Logan Lucky. That's right, I haven't seen the new Star Wars movie yet, and probably won't for a long time. 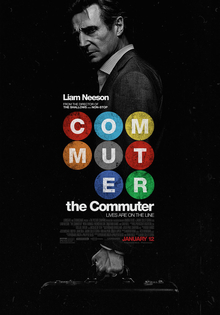 We decided we would see The Commuter, and I was skeptical right from the start. Was this just going to be Taken on a train? Well yeah. And then I remembered how awesome Taken was, and how great of an action actor Liam Neeson is. Basically the entire movie I was shuffling around as the next twist and turn happened. The acting was great, the story was great, and it was worth seeing on the big screen. The special effects were terrible, like laugh out loud terrible, but in a sense I think it was meant to be a little post-modern. My only other complaint is the nachos I was eating were sub par. Watch this movie. Saturday night, in an effort to boycott the Canadiens, we decided we would watch Stronger staring Jake Gyllenhaal about Jeff Bauman who had both his legs amputated following the Boston Bombings. The story was gut wrenching, and the movie was sub-par but the acting was fantastic. Gyllenhaal and his co star Tatiana Maslany gave award worth performances that carried the movie along. Tonight I may actually finish reading the 1500 page book IT that I started last July thinking I would finish it in time for the movie. I averaged 8.3 pages a day. Pathetic.